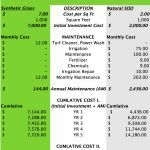 Lawn Kings: Synthetic Grass / Artificial Turf Price Guide 2018 - Lawn Kings Inc.
HOW MUCH DOES SYNTHTIC GRASS / ARTIFICIAL TURF COST TO INSTALL? This will be a rather long and very detailed explanation. It is meant for those of you who Guys & Gals who want to dig into the nuts and bolts of a typical Lawn Kings Synthetic Grass Installation. Front Yard, Backyard – both? Access to Project Area – is it easily accessible or narrow, up a hill, far away, etc.? Type of Turf – economical 1.5” or most natural looking 1.75”-2” height? We do offer FREE ESTIMATES, when we visit we’ll take a short video, measure up, and note the work situation and project particulars. Oftentimes we can quote the same day and if not virtually always before noon of the following day. NOTE: This is a BALLPARK or GENERIC HYPOTHETICAL ESTIMATE your actual price may be significantly lower or higher. 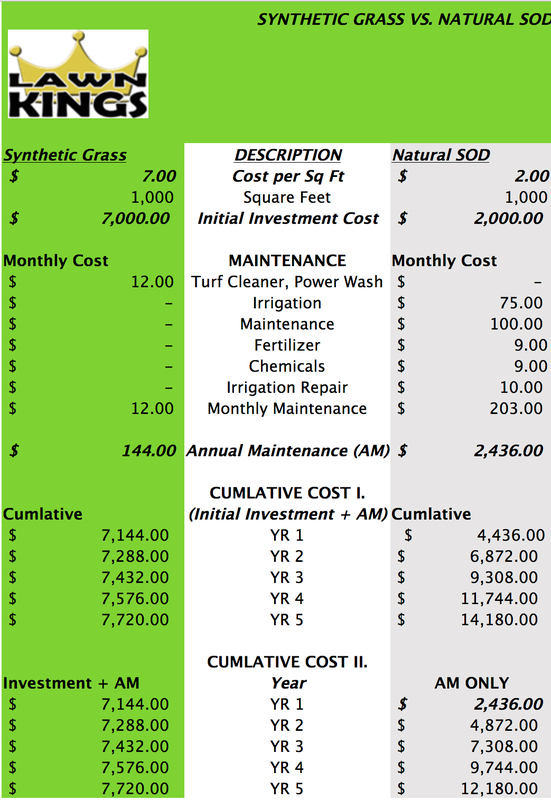 This is a list of the basic elements required for a synthetic grass installation project. Operational Costs: Dump Fees, Fuel, Delivery Fees, etc. Overhead: Workers Comp., Liability Insurance, Online Advertising, etc. $3.00 $3,000.00 Competitively Priced Outstanding Crew, we are competitive as possible! $0.10 $100.00 Fuel: trip to the dump, foreman and/owner visits etc. Lawn Kings, Inc. will provide a Complete Price Quote – we mention this because we know of a couple of the larger synthetic grass companies will provide a seemingly low or competitive quote for the turf and then will add on additional products such as; Edging (BendaBoard), Infill (Zeolyte or other), Accessories (Nails & Staples, etc.). Lawn Kings typically will provide one price for the entire project with the turf you select. Contact us today for a FREE ESTIMATE!